This topic is bound to split the room and that, in some ways, is why I decided to write an article on it. I’m not saying I think Bimodal is a good model to adopt or a bad one. I personally think it’s dependant on the business, the department and on the IT leader of the department. What I’ll attempt to do in this article is explain the concept behind it, the reasons why you would think about implementing it and the things to consider. As we grow as a business we cannot work at the same pace we have worked in the past. Although Bimodal is aimed at enterprises, every IT department is expected to innovate and be agile whilst continuing to provide stability and efficiency. The enterprises struggle with this as they are entrenched in legacy systems and complex processes. Gartner came up with the idea of running two coherent models of IT to tackle this requirement. It is essentially a practise or a framework for managing IT delivery. 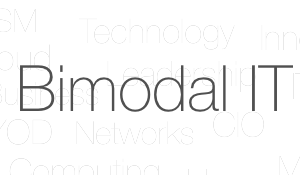 This concept was named Bimodal – two working speeds of the IT department. The first, referred to as Mode 1 is the traditional IT speed, focusing on stability, governance, safety, ROI and efficiency. The second speed, Mode 2, is a new way of working for the IT department. Doing things fast, being agile, driving innovation, driving delivery and adding value to the business. In a sentence, we need Bimodal to address the digital demand within business at present. It is easy to see it is this type of model that is required to help drive the Digital transformation, it allows us to continue to operate whilst leveraging the latest changes in technology and the advantages of things like Cloud, IoT, Social and Analytics to exploit commercial opportunities. Mode 2 can contain some uncertainty with the need to adapt depending on what the market is demanding. The agility and flexibility it provides however allows for solutions to be deployed or delivered quickly though and hence can be attractive to businesses. The digital world also requires collaboration so the need to provide innovative, flexible working practises or processes is also essential. On the surface, it would seem as though the decision to adopt such a model would be an easy one. It is quite possible that even organisations that decide against the Bimodal model, someone will decide there is a need to create a department tasked with driving Innovation or Leading the Digital agenda. It makes sense for IT to be involved so why not lead on it. The first thing that comes to mind is that a natural wedge may be placed within the IT department. Half the team are dedicated to BAU and keeping the lights on the legacy technology whilst the other half get the job of playing with new technology. There is every chance that the internal teams will be fighting for budget, resources and skills. Good leadership is essential in this instance and ways of rotating the team or keeping everyone happy should be high up on the agenda. I would also argue that Innovation and Digital Transformation shouldn’t be “bolt on” services, they need to be embedded within the organisation. I am of the opinion that this would be difficult to achieve by simply creating to modes of delivery within the IT department. Finally, how do you manage risk? I don’t have the answer to this, I am simply asking the question. IT has been risk adverse in the past, how do we ensure we are continue to protect the businesses long term? 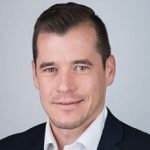 Are we compromising reliability and security in favour of responsiveness and speed of delivery? As I stated earlier I am unsure whether Bimodal IT is a good thing or not. Like a lot of models there are probably good things we can cherry pick from it for it to work for our business. My argument would be what is the alternative? There is a need to embrace digital transformation and to innovate so we need a strategy for providing this platform. The data I have seen suggests more and more IT departments are adapting some sort of Bimodal approach. The key is to ensure a collaborative approach, whilst communication and aligning strategies between mode 1 and mode 2 will be essential.